"Who gave you the right to pass judgment on me? You psalm-singing louse!" Few literary works of the early 20th century were quite so contentious as W. Somerset Maugham's short story, "Miss Thompson," and the plays and films made from it. Considering the subject matter, a woman of loose morals and her conflicts with a missionary in the South Seas, set against a steamy monsoon, it's a wonder that any film was made of this story at all. A number of unfortunate changes had to be made to bring this one to fruition, and unfortunately time has done the film an even worse damage. A ship from San Francisco bound to Apia stops at Pago Pago, and between quarantines and the onset of the seasonal rains, the passengers are stuck there, staying at the hotel of Trader Joe Horn (James A. Marcus). Prominent among these passengers are Alfred Davidson (Lionel Barrymore), a merciless reformer, and his wife (Blanche Friderici), the more temperate Dr. Angus McPhail (Charles Lane) and his wife (Florence Midgley), and a vivacious, fun-loving woman of questionable morals, Sadie Thompson (Gloria Swanson). While she is all for having a good time with the local marines, notably Sgt. Tim O'Hara (director Raoul Walsh), she meets with disapproving glares from the Davidsons. Before long, Davidson has complained to the governor of the island, demanding and receiving an order that Sadie be returned to San Francisco and not be permitted to go on to Apia. Yet he has not taken into account either the fury of Sadie Thompson or the weakness of his own flesh as his own hypocrisy is exposed. Swanson turns in a wonderful performance as Sadie, ranging from the life of the party to completely enraged fury personified. Joan Crawford's performance in the 1932 sound remake, Rain, pales in comparison to the vividness of Swanson. Even the wrathful explosion is more effective with Swanson, sans sound, than Crawford with the aid of a dialogue track. Lionel Barrymore makes a good Davidson, not quite as rigid as Walter Huston in the 1932 version, but there is clearly something more going on behind his eyes. The fact that the missionary was changed from the story and stage play here to a generic reformer badly hurts the impact of the film, but apparently it was considered a necessity to avoid outrage from churches. Walsh makes for a pleasant O'Hara, burly and likeable, believably smitten with Sadie. He and Swanson have an excellent chemistry together, best seen in the episode where he lights her cigarette with a match held between his teeth. The whole tends to compare unfavorably to the 1932 film, however, because of the remake's masterful use of sound in capturing the mood. Without Alfred Newman's evocative theme, or the sensuous blare of St. Louis Blues from Sadie's gramophone, or most importantly, the incessant sound of the rain, we don't get the immediacy of the later version except in a few key scenes. Appreciation of the silent version is hindered by the fact that this disc represents the sole surviving print, and unfortunately, time has left its mark. The ninth and final reel of the film, including the climax, has completely deteriorated and has been replaced by a reconstruction. This 1987 reconstruction by Kino is decent, but it fills one with an immense feeling of sadness at what has been lost, and how a fair appreciation of this picture is really impossible now. Image Transfer Review: Since this is the sole surviving print, there are obviously limits to what the transfer can be. In addition to the completely destroyed final reel, there are several spots where nitrate deterioration is so far advanced to nearly block out the picture. Despite this, long stretches of the film are clear and crisp. Others are soft and lacking in definition, which is sometimes probably intentional, and at other times the result of poor contrast. I'm not convinced that Kino coaxed everything out of this print that they could have, since there is a fairly low 4 Mbps image bit rate. Despite the frame damage and speckling, this is certainly watchable. One has to just count one's self lucky to be able to see this film at all. Audio Transfer Review: The audio track is an orchestral score by Joseph Turrin which has very good sound indeed. There is some minor hiss, but the wind instruments (which form the bulk of the orchestral forces) come through quite clearly and without distortion. Extras Review: A lengthy essay on the various incarnations of Sadie Thompson is the most interesting extra presented on the disc. 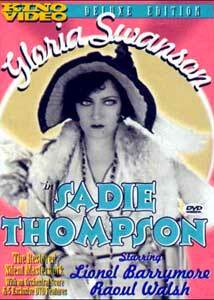 It covers the real-life Sadie, her translation to literature, stage and screen. A fair amount of production detail is included here. There is a scene comparison section, which gives two key scenes as they appear in the original story, the play version, Rain, and the 1928 and 1932 films. These are of Sadie's first appearance and her explosion at Davidson on learning he has arranged for her deportation from the island. While Swanson comes out the clear winner on the latter scene, the first appearance of the character in Rain, with brief shots of Sadie's hands and feet on the doorframe is a truly unforgettable bit of filmmaking. The comparisons are instructive as to how the same scene is envisioned quite differently by four different creators. The disc includes a separate section on the lost ending of the film. One can go to the reconstruction directly, read the screenplay for the final reel (which differs quite significantly from the reconstruction), or watch the ending of the 1932 version. The inclusion of the screenplay in particular is a very nice extra, since fleshes out the conclusion rather more satisfactorily than the reconstruction was able to do. Wrapping up the package is a set of fifty-three stills from the film, several of which are minor variations on one another. Chaptering is barely adequate. A classic adaption, containing a splendid performance by Swanson, with an artfully reconstructed final reel, is definitely worth checking out. While there are some image problems, what can you do with the only (barely) surviving print?